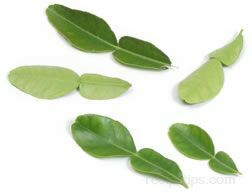 A small to large oblong leaf, pale green to dark green in color (larger leaves are darker green), that are grown on fruit trees producing limes. Trees that grow the Kaffir lime are commonly used for harvesting lime leaves. The lime leaf is often used as a seasoning to provide a fresh citrus overtone in a variety of food dishes especially in Cambodian, Indonesian and Thai cooking for soups and curries. The leaves are also used to produce beverages such as tea and wine. When preparing foods which will use the leaf to add flavor to the entire mixture, such as soups, use the leaf whole or tear the leaf into slightly smaller pieces and allow them to be added so the full essence of the flavor can be emitted. When adding the leaves to curries, salads or stir-fried dishes, slice the leaves into very narrow strips and place them in the foods being prepared, thus enabling the leaf to moderately flavor the food without adding an overpowering taste. Lime leaves can be stored in airtight bags and placed in a refrigerator for shorter periods of storage or in a freezer to be kept for up to 6 months.